Krakow - Wayne Rooney insists England can mount a serious challenge at the European Championship despite the mood of pessimism surrounding Roy Hodgson's injury-hit squad. Injuries to key players and a suspension which rules Rooney out of England's opening two games have left many observers thinking Hodgson's men will do well merely to advance from Group D.
However Manchester United star Rooney is refusing to write off England's chances as they prepare for Monday's daunting opener with in-form France after touching down at their Krakow base camp on Wednesday. "We are trying and no-one should even think we are just turning up," the 26-year-old told the BBC's Football Focus in an interview. "Sometimes when you lose, you have to hold your hands up. But when you look at our squad, I don't see why we can't win it. "There have been a lot of changes but I will expect big things. "If other people don't that is down to them. But we are good enough to get in semi-finals and finals. That is the aim." Rooney is sidelined from England's opening games against France and Sweden following his moment of madness in the final qualifying game against Montenegro last year when he was red carded for lashing out at a defender. Rooney, who first shone on the international scene with his performances at Euro 2004, admits he has come to terms with his punishment, which was reduced from a three-match ban following an appeal. 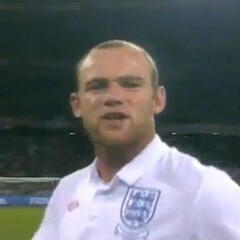 "It is the price I have to pay for making that mistake," Rooney told BBC TV's Football Focus. "It happened and I have to accept it. I will just prepare myself as if I was playing and hopefully come back into a winning team." Rooney meanwhile praised the impact Hodgson had had on the squad after only two games in charge. "Already you can see he is very organised, which is something we have lacked during my time with England," he said. "It is great to have an Englishman in change."